what is better is it works every time! did some experimenting with various amps to boost the led's range. but eventually gave it a big thumbs down, not consistent or reliable. removed the guts from the remote and fitted this into a small box with green led power indicator and switch. the 3v battery was replaced with 2 AAA and a RCA connection plug fitted to trigger the remote. i can now link up the interval timer to this reliable long range infrared remote. This is a hi-jack of the original post for which I am mildly sorry. 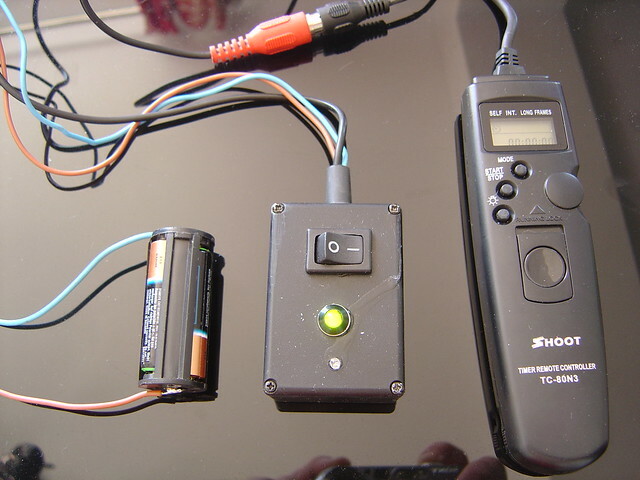 There is a another way to achieve the goal of an interval timer for any IR release capable Pentax camera - combine a mechanical timer switch with a cheap (US$1.65) IR remote. Here is my post on how to add an external switch to the cheap IR remote. My post shows how to remotely trigger the camera from any angle, any practical distance and beat the problem with bright sunshine. Once you have the ability to plug in an external switch, you can rig the remote with any kind of switch you want. You could even do automated extended exposures with the bulb shutter using a mechanical timer. Or make the equivalent of a 'trail cam' with a motion activated switch. The ideas are limitless. +1 ... and the few pennies it would have cost to keep the legacy screw in port on the shutter button for a mechanical release. If wireless release was really important to me, I'm sure Pentax would have been happy to sell me a paired transmitter/receiver set for that body jack - either lower cost IR or a higher cost RF. As for battery life, at US$1.65 (delivered), it is less expensive to steal the battery from another remote than to purchase another battery at local retail prices. And, I agree it would be easy to lash a 1.5v AAA or AA battery to the IR remote for longer life. One thing I haven't tested, but might work, would be to put that greater capacity 1.5v power source in the external switching device rather than make the IR transmitter any bulkier. This thread was recommended to me as I was in the market for an IR unit and this looks perfect, Just wondered if anyone could re-up the android apk app if possible please. As all the links I've tried seem to be dead. DOes anyone have that wav file? The link in the first page just brings me to a download-manager page! I know, this is an old thread. I just wanted to say thanks to all those who worked this out. I downloaded the .WAV file zip from post #86 in this thread. I made my cable from an old 3.5mm to RCA cable using NTE 3027 LEDs from Fry's (in case someone is wanting a source). I'm not the best with this iPod, and couldn't figure out how to get it to just repeat a song. I wound up creating a playlist for each separate file, then under Music options I chose repeat. Go to Music, playlists, pick the one you want, and hit play. any idea of how to change that so that it works with red/green or blue LED? Unfortunately it looks like your android app is no longer available. Would it be possible for you to upload it again to make it available for the community? This is pretty much the coolest thing EVER. And all Pentax cameras take the same remote code, right? So this should work for them all. As long as they have an IR port to start with ! All times are GMT -7. The time now is 05:43 AM. | See also: NikonForums.com, CanonForums.com part of our network of photo forums!